Docosahexaenoic acid (DHA) is an omega-3 fatty acid. It functions as an important component of brain tissue, and plays important roles in controlling inflammation throughout the body. Accordingly, we will limit our discussion of DHA, Neuromins® to a brief summary of relevant research, and let you draw your own conclusions about what medical conditions it may be effective in treating. DHA is significantly involved in cerebral brain development and retina function in the eye. DHA supplementation is good insurance for anyone who wants a well-functioning brain, but it is especially important during preganancy.9 Pregnant mothers transfer DHA directly to the fetus to support rapid brain and retina development. During infancy, DHA is also supplied via mother’s breast milk for continued cerebral development. Some people have inadequate concentrations of DHA due to low-fat or vegetarian diets. LifeLink’s suggested dosage is 200-400 mg (1-2 softgels) per day. 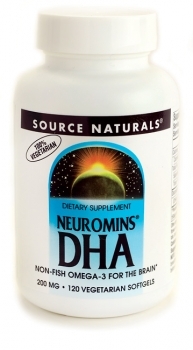 Are DHA, Neuromins® supplements useful for the conditions and purposes mentioned above? We aren’t allowed to tell you, so you should take a look at some of the references cited here, and then decide for yourself.